The UCB-Oxford Late Stage Functionalisation (LSF) Project is an exciting new collaboration between Oxford Chemistry and UCB BioPharma, a biopharmaceutical company with research activities in Slough (UK) and Braine (Belgium), who specialise in the treatment of neurological and immune disorders. Established in May 2016, the collaboration aims to develop novel methods for the late stage functionalisation of drug-like molecules, and has a unique structure designed to maximise the sharing of scientific expertise and resources between academia and industry. The Oxford team consists of five PIs (Profs Chris Schofield, Darren Dixon, Michael Willis, Martin Smith and Robert Paton) and four full time postdocs, while the UCB team is led by Dr Christophe Genicot and includes a number of their internal scientists. The focus of the project is to develop novel methods for late stage functionalisation of drug-like molecules that will facilitate the efficient diversification of lead compounds in the search for new, more effective pharmaceuticals. The unique structure of the collaboration combines the complementary and diverse expertise of the five Oxford PIs with the valuable insights and perspectives of UCB and their scientists, with the aim to develop science which is both cutting edge and industry relevant. Waters Corporation have continued their long-standing support for the work of Prof Justin Benesch by underpinning an Industrial CASE award. 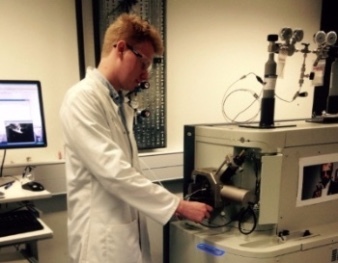 The co-supervised DPhil student, Shane Chandler, has focussed on developing methods for probing the surfaces proteins and their complexes through hydrogen-deuterium exchange (HDX) reactions inside the spectrometer. The hope is these experiments will provide a novel means for using mass spectrometry to elucidate biomolecular structure and separation. Prof Benesch comments: “Working with the Waters R&D team allows us to push the boundaries of what is possible using mass spectrometry, and therefore gain the most structural information from the systems we study and extending the reach of the technology”. Waters have provided a wealth of technical guidance and advice, including behind the scenes access to both software and hardware for the control and manipulation of ions in the mass spectrometer for the structural studies that drive the project's biological questions. Shane has presented his work at international meetings: the Isolated Biomolecules and Biomolecular Interactions conference, and the American Society for Mass Spectrometry meeting in Texas. Prof Justin Benesch is a Royal Society University Research Fellow and Associate Professor, and Tutorial Fellow in Physical Chemistry at University College. After his PhD with Prof Carol Robinson in the Department of Chemistry at the University of Cambridge, Justin spent a year as an MRC Discipline Hopping Fellow, during which he learnt electron microscopy techniques in Helen Saibil’s lab in Birkbeck College, London. In 2013 Justin was awarded the Alfred Tissières award from Cell Stress Society International. Oxford Impedance Diagnostics, a disruptive platform for medical diagnostics, was launched in April 2016 based on research from Prof Jason Davis and his group in the Department of Chemistry and Prof Paulo Bueno based at the University of Sao Paulo, Brazil. During the past five years, Davis’s research team have been engaged with collaborating clinical teams in establishing electroanalytical platforms capable of the sensitive detection of antibodies in Parkinson’s Disease patient cerebrospinal fluid and plasma and in diabetes patient serum analysis. Most recently, this work has been extended to the multiplexed analysis of real clinical samples within electrode arrays. His group, with that of Prof Bueno, have also developed unique molecular detection methodologies based on hydrogel interfaces, signal processing, and both redox and quantum capacitance. These routinely out-perform standard ELISA or chemiluminescence assays in terms of sensitivity, user intervention/error and time. They are also natively capable of reporting absolute and relative levels of multiple markers. The core technology is based upon micro electrical impedance and enables them to develop assays with a unique combination of sensitivity, low cost, speed, convenience and multiplexing. Due to the expertise in utilising electrochemical impedance within the Davis group, tests for new biomarkers can be developed quickly, enabling the company to develop collaborations with other academic groups and pharmaceutical companies looking for new companion diagnostics or improved assay performance for existing biomarkers. The company has secured significant investment to develop a commercially viable, highly sensitive protein biomarker assay system for use in clinical laboratories or at the point-of-care. The core technology is based on a marriage of electrochemical impedance, fluidics and interfacial chemistry and generates a validated ability to quantify panels of biomarkers in patient samples in an ultrasensitive manner. It presents a potentially transformative ability to detect disease many years before it becomes symptomatic. Prof Jason Davis is Professor of Chemistry, Senior Subject Tutor in Chemistry at Christ Church and Dr Lee's Reader in Chemistry. 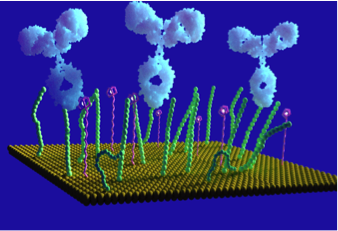 The Davis Group develops and applies methods for the design, analysis and manipulation of functional molecular interfaces (bioelectronic, biochemical, wires, mechanically interlocked, nanoparticles), often at molecular scales, and are actively engaged in the use and development of state of the art molecular, theranostic and medical imaging technologies. Comp Chem Kitchen (CCK) is a regular get together for researchers and students using and developing computational methods to tackle problems in chemistry, biochemistry and drug discovery. The main focus is on cheminformatics, computational chemistry, and molecular modelling, but also includes neighbouring areas in materials and bioinformatics. This initiative, developed by Profs Rob Paton and Richard Cooper from Chemistry, Prof Garrett Morris from Statistics and Prof Phil Biggin from Biochemistry, encourages and facilitates interdisciplinary collaboration between computational chemists: “Our aim is to encourage people involved with coding and methods development to share best practices, even code snippets and software tools, and avoid re-inventing wheels”. A typical meeting begins with an invited talk of around 30 minutes, followed by five minute ‘lightning talks’ which can be used to demonstrate software, or to share information about research problems or review published research. The team also invite speakers from industry and non-profits from time to time, and occasionally provide or organize software demos and tutorials in several topics: software development (e.g. : Python, C, C++, CUDA, shell, Matlab, Gnuplot), informatics tools (RDKit, CSD, KNIME) virtual screening and molecular docking; quantum methods, including DFT, amongst others. Details of upcoming meetings and past speakers is available on CCK's website. If you have ideas for speakers, or would like to give a talk, get in touch with the team. The next meeting will be held in the Abbott’s Kitchen (Inorganic Chemistry Laboratory) on 12th January 2017 5.00pm. The main speaker will be Dr Russell Viner from Syngenta, UK, on Structure-Based Design of a Novel Class of Herbicidal HPPD Inhibitors.